These images, supposedly from Doom 4, have popped up. It seems they were inadvertently spilled by the portfolio of artist Thao Le, a senior environmental artist at id Software (and since taken down). Turning up alongside the images, a user on 4chan has, in addition to sharing the pics, also claimed that the game has been cancelled. Which is funny, because we'd heard something similar last October. On the subject of the cancellation, Bethesda's Pete Hines has again come out in defence of the game's development, telling Joystiq "DOOM 4 isn't cancelled. When we're ready to talk about it and show it off, we'll let everyone know." While that addresses the cancellation rumour (itself curious, given it's the second time in six months that's popped up), he mentions nothing about the authenticity of these screenshots, which were reportedly originally available on the artist's site (and subsequently hosted on 4chan) but since taken down. 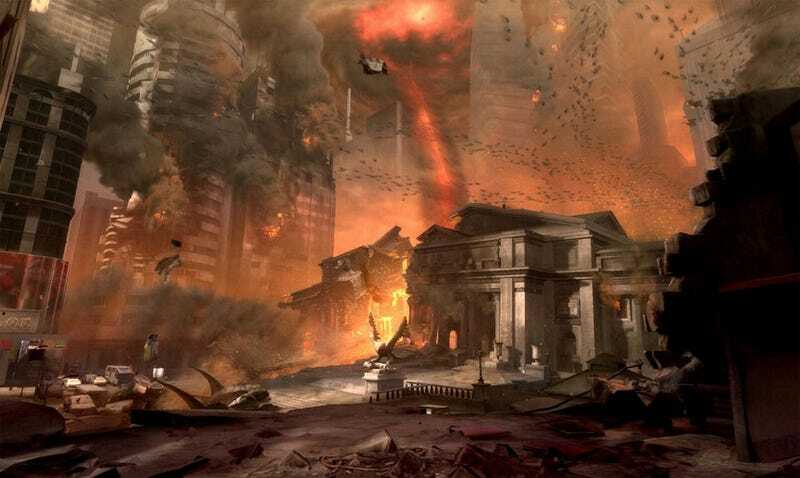 They appear to show the forces of Hell tearing up planet Earth, a setting familiar to fans of the series since that's the basic premise of Doom II. That is, if they're legit. Sure, they look in keeping with what we last saw from id in RAGE in terms of lighting, etc, but then blood-splattered hallways aren't exactly hard to fake. We've contacted Bethesda (id's parent company) for comment on the images, and will update if we hear back. On a related note, and less speculative, here's a still from an art visit to id, showing a model of a weapon with a Doom watermark clearly visible at the top right.